Officially announced by Sprint late last month, the Kyocera Torque will embark on setting the standard for the ultra-rugged smartphone set on March 8th. The Torque is built to withstand dust, shock, humidity, and other extreme conditions to MilSPec 810G. The device can handle being submerged in water to a depth of 1 meter for up to 30 minutes. The Torque features Sprint’s Direct Connect push-to-talk service, and also has “Smart Sonic Receiver” technology which uses bone conduction to transmit sound in noisy environments. The Torque is a 4G/LTE device, runs on Android 4.0 Ice Cream Sandwich and has a beefy 2,500mAh battery which should be good for over 18 hours of talk time. A dual-core 1.2GHz Qualcomm Snapdragon processor will crunch the numbers while you take pictures with its 5MP camera. In front there is a 1.3MP camera. The Kyocera Torque has 1GB of RAM and 4GB of expandable storage. If you are cruising on America’s third largest carrier, the Kyocera Torque can be yours for $99.99 (after a $50 mail-in rebate) with a two-year service agreement and will be available in the stores or online beginning March 8th. Smart and tough devices like this are great for folks that work in construction sites, or are clumsy with their gadgets. Bear Grylls shares his perspective on the Torque in the video below. OVERLAND PARK, Kan. (BUSINESS WIRE), February 22, 2013 - Sprint (NYSE:S) and Kyocera Communications Inc. today announced the March 8 availability of Kyocera Torque, the “live more, fear less” handset built to survive extreme elements and everyday life. 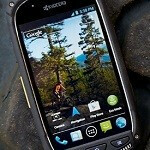 The ultra-rugged, 4G LTE Android™ smartphone will be available in all Sprint retail channels, including Web (www.sprint.com) and Telesales (1-800-SPRINT1), for $99.99 after a $50 mail-in-rebate via reward card, with a new line of service or eligible upgrade and two-year service agreement (pricing excludes taxes).1 Powered by Android 4.0, Ice Cream Sandwich, 4G LTE speeds and up to 18.9 hours of talk time, this device will benefit from Truly UnlimitedSM 4G LTE data, text and calling to any mobile device with no metering, no throttling, and no overages, all while on the Sprint network. Mail-in rebates are still a thing?